At some point your hens will go broody, particularly Heavy Breeds which have a strong tendency to do so. 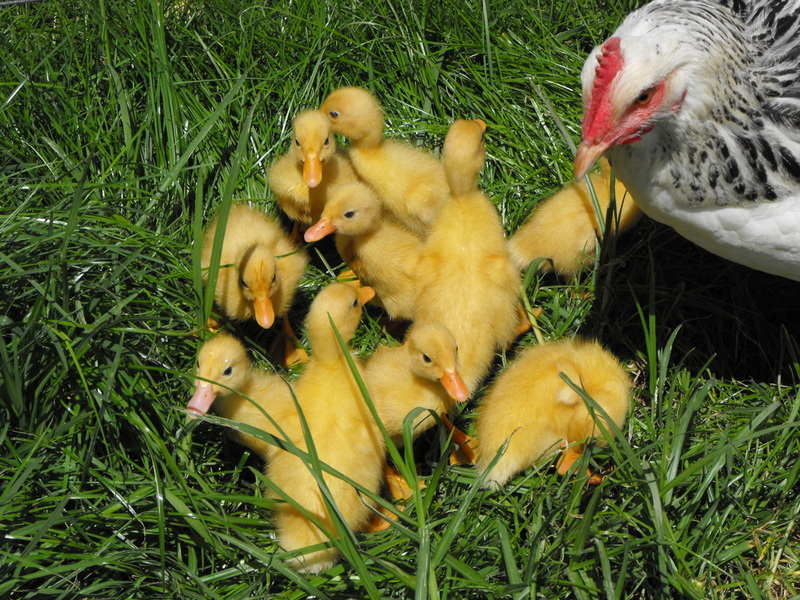 The instinct to go broody is usually triggered by increasing day length and the hormone prolactin is released from the pituitary gland, causing her to stop laying. A broody hen will stubbornly sit on a nest with her feathers fluffed up and will screech at you if you approach or try to move her. You will also notice feather loss from her underside, where she has plucked feathers from her belly to provide skin contact with her eggs to maintain the correct body temperature for incubation. If you want to hatch eggs, remove her to a quiet coop where she wont be disturbed by other hens trying to share the nest. This will avoid breakages and confusion over who's eggs are who's and allows the broody hen to get on with the job in peace. Her newly hatched chicks will also be safe from being pecked and crushed by other hens. Wait a few days to make sure your broody hen is a committed sitter and give her an egg, fake or real, to keep her interested until your eggs arrive. 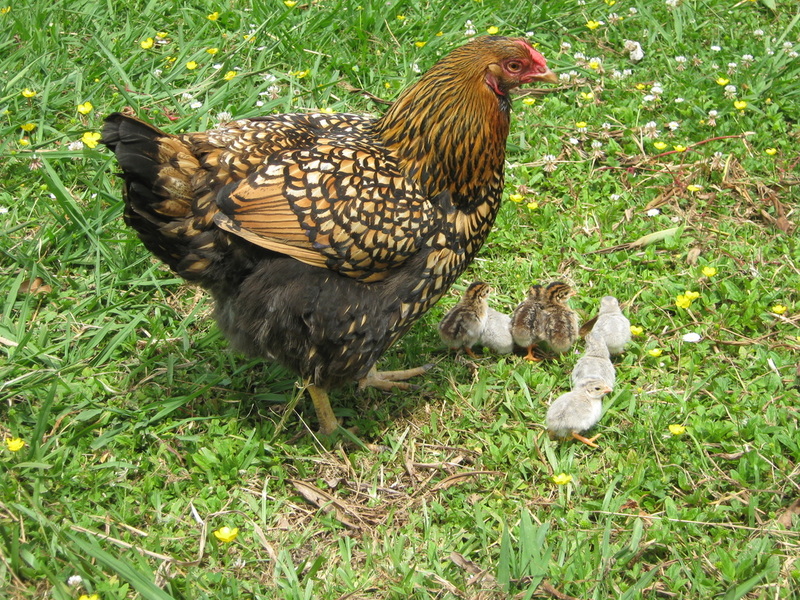 You cannot make a hen go broody simply by presenting her with a clutch of eggs. This could be wasteful, especially if you have gone to the expense of buying eggs. Broodiness is contagious and will set other hens off, so this is another reason to separate her from the flock so your hens don't all go off the lay at the same time. Chickens have no concept of time and their metabolism slows right down during broodiness and she wont leave the nest very often and will eat about a fifth of the amount she normally eats. Some days she wont eat at all. Persistent broodiness can pose a health risk and she can lose as much as 20% of her body weight and lose condition and possibly starve to death. For this reason, avoid letting your hen sit for more than four weeks. Make sure she has plenty of space so she can get off the nest when she needs to poo and stretch and have a feed. If she can have access to free range for a time, this will allow her to take a dust bath and some time out before returning to the nest. Don't be alarmed if she's off the nest for half an hour or more. Eggs need to breathe and their metabolism will slow as though "on hold" until they warm up again. Cooling time is usually made up at the end of term and hatching may be delayed by a few hours as a result. Even eggs that have cooled off for 24 hours will still hatch, so don't discard cooled eggs. They will generally pick up where they left off once warmed up again and hatch later. 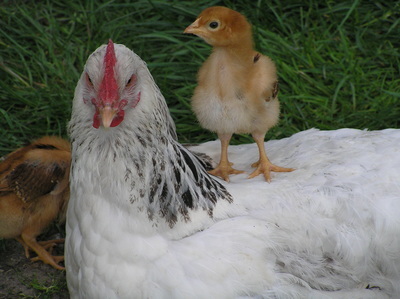 A broody hen can be vulnerable to mite infestations as she sits. Hens have been known to be found dead on the nest from mites sucking their blood to the point where they become anemic and die. Check regulary and dust the nest and hen with Diatomaceous Earth and Flowers of Sulphur. If you don't wish to hatch eggs under your broody hen and need to cure her in order for laying to continue, you will need to remove her from the coop and place her in a separate coop with enough breeze to cool her off and no home comforts such as nesting materials. Provide her with water and slightly less food than usual. Keep her confined for four days then return her to the flock. If she persists and heads straight back to the nest, repeat the isolation for another four days. This will usually be enough to break the urge. If you leave it too long before attempting to cure a broody hen, she will have stopped ovulating and wont come back into lay for up to six weeks. Act quickly and she will only be off the lay for a week or so. 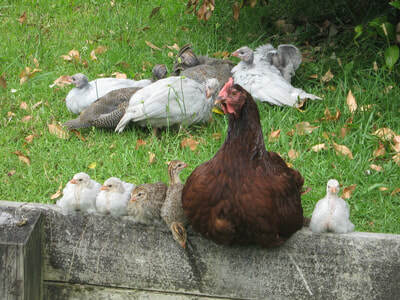 Hens also make great surrogate mothers for Guinea Fowl, ducks and turkeys. The incubation temperature required is the same as for chickens, though gestation periods will differ.